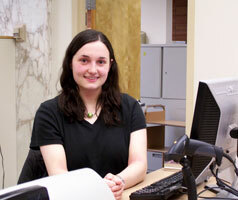 Sarah Zinn is Falvey Memorial Library’s current Student Employee of the Month. She works at Circulation and helps with all aspects of interlibrary loan (ILL). Sarah receives the incoming ILL book requests, processes articles for delivery, and prepares returned ILL books to be shipped back to loaning libraries. After graduation, Sarah plans to attend law school. The University Staff Council at Falvey selects a Student Employee of the Month based upon nominations from the department supervisors of student employees.